Don’t worry if you don’t know the answers to all their questions. Be honest if you don’t know and turn the question round “Good question, how could we find out?” Someone in the class might know, or it could become a research task or investigation. Have a question wall / wonder wall where they can post their questions during lessons. Take it outside. Look for opportunities to take the science outside the classroom. Use the school grounds as a resource. Ask the class questions. 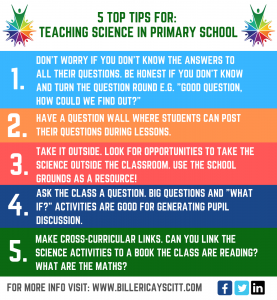 Big questions and “What if?” activities are good for generating pupil discussion. Can they suggest positive, minus and interesting points? Make cross-curricular links. Can you link the science activities to a book the class are reading? What are the maths, computing opportunities? Can you link it to other subjects like art or history?